Since the season for Hatch Chilies is so short, I thought I’d take advantage of it and see how many ways I could use them. If you’ve been following this blog or know me, then you probably figured I’d find a way to incorporate them into wings. What can I say? They are my 5th food group as Mrs. G jokingly refers to them. Still being a newbie to Hatch Chilies, I thought I’d start off doing a search on the internet for wing recipes. I was kind of shocked that I was not able to find one, maybe you are a better searcher than me, but darned if I wasn’t able to stumble along anything. I did find a recipe that used green chilies, so I thought I would use that as a base and develop my own. Remove peppers from the grill and place in a bowl and cover with plastic wrap. Allow to cool. This process with help steam the peppers and make peeling the skins off easier. While waiting for the peppers to cool, add the rest of the ingredients (minus the chicken) to a food processor or blender. Once the peppers have cooled enough to handle, remove the skins and cut off the stems. Slice open the peppers, lay flat and using a knife scrape out the seeds and veins and discard (you can reserve some of the seeds if you prefer hotter wings). Add the peppers to the food processor and puree. Taste and adjust seasonings as needed. Place the chicken wings in a gallon zip lock bag and add the marinade. I like to put the bag in a bowl or casserole dish in case there are any leaks. Put the chicken in the refrigerator and allow to marinate for 2-8 hours. Preheat your grill to 400F. If using a Kamado style grill (like the BGE) set it up for a raised direct cook. 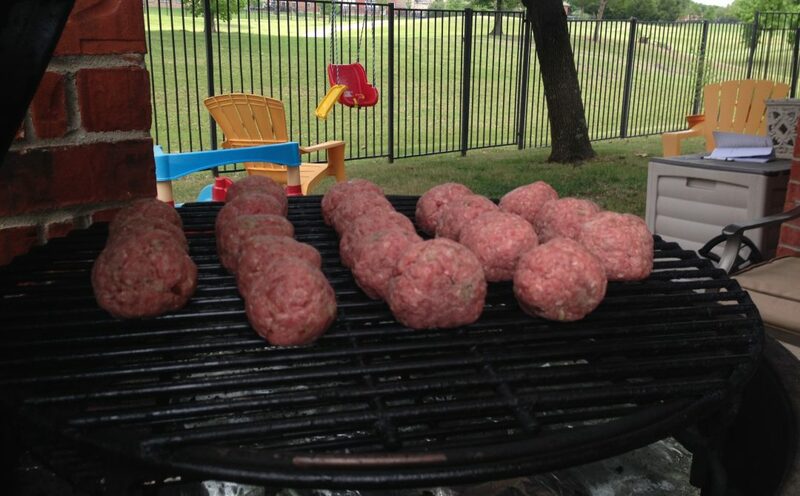 For other grills, set up a two zone fire, one hot and one warm. Remove the wings from the marinade reserving the marinade. Bring the marinade to a boil, reduce heat and simmer for at least 10 minutes. 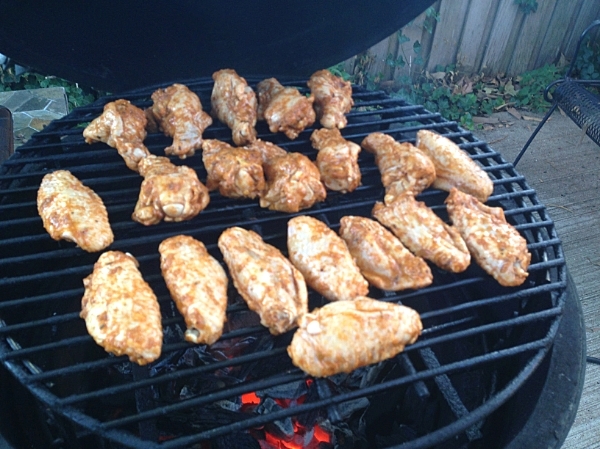 Grill the wings for about 30 minutes, flipping and basting with the marinade every five minutes. If using a grill other than a Kamado style grill, you may need to shuffle the wings around to avoid flare ups or burning. Chicken is done when it reaches 165F, but I generally take mine to about 175. It allows more of the fat to melt off. I was quite surprised by these wings. At first, you get a strong taste of lime, followed by an earthy flavor from the peppers along with a touch of smoke from cooking over lump charcoal. Finally, a slight burn on the lips begins to develop after eating two or three. Not too much, just enough to remind you of the Hatch Chilies and jalapeno peppers that were in the marinade. I never did get much of a mouth burn, however, which sort of surprised me. I thought the addition of the jalapeno peppers would have made it hotter. I would have to say that these are probably some of the most unique wings I’ve ever had due to the addition of the fresh squeezed lime juice. Heat and citrus, who would’ve thunk it? Definitely a top five for me in the wing category. Once Hatch Chile season is gone, I’ll have to try them with Anaheim peppers and see if they work. I really hope I don’t have to wait until next year when Hatch Chiles come back. 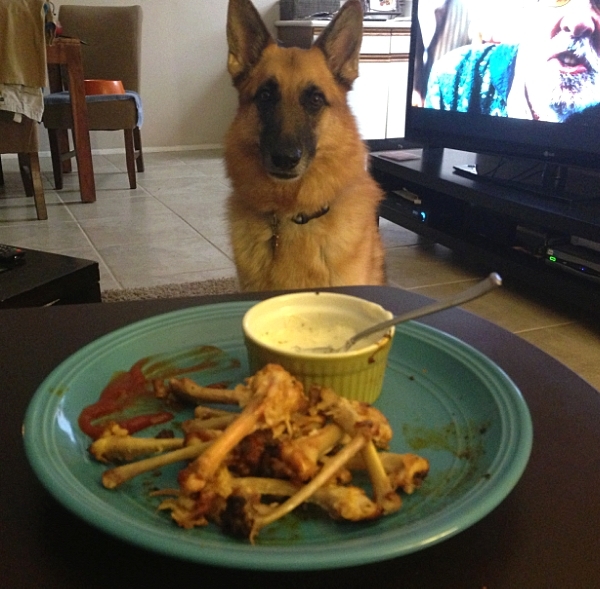 Since Mrs. G was out of town, this was a sit in front of the TV kinda meal. Poor Olie didn’t get any. Hi, Jason. Nice looking marinade. I bet the wings were tasty, tasty, tasty. 🙂 Right now, Hatch chiles are everywhere in DFW. The problem with buying Hatch chiles in DFW is they don’t tell you the varietal and the stores only get the mass produced mild and medium crop. Some Hatch chiles are mild like an Anaheim (Anaheims actually were originally grown in New Mexico until Mr. Ortega bought property outside of Anaheim and moved his chile factory to California). Some have thick skins that are suited for rellenos. Others are fiery hot. The NuMex Big Jim produces a chile that is 12″ long compared to most New Mexico chiles that are 7 – 8 inches long. I prefer the slightly hotter New Mexico green chiles (NuMex Barker X-Hot) and typically buy 10+ pounds from a supplier in New Mexico. I roast them, peel them, vacuum seal and freeze them. They freeze beautifully and roasting them keeps me in chiles for about a year until the next Hatch season. 🙂 I’m hoping to get down the El Paso to see the Baby Lady’s family in September and bring back a 20 lb. case. Wow! This is so tasty looking. I have already pinned to my Hatch Green Chile Pinterest board and also to my tailgating board – just yum! Jason, since you’re a fellow Tot-o-phile, do you egg yours or oven them? 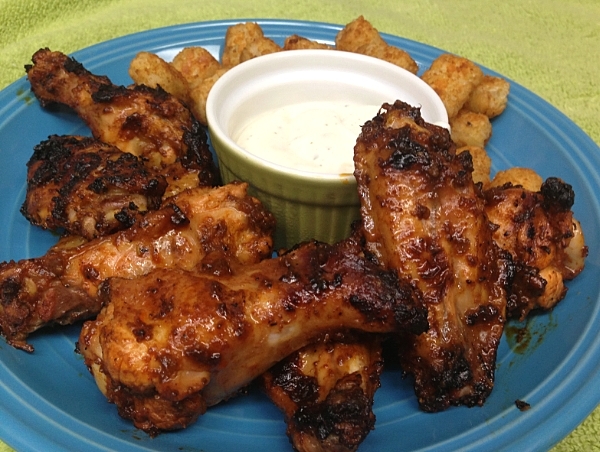 I love a little Salt Lick rub and a little cherry smoke on egged tots. They are the bomb. Oh, and great looking wings too, I don’t cook them often enough! Greg, I’ve done them both ways. Depends on what I’ve got going on the Egg and what temperature or just how I’m feeling. I don’t really see any benefit tastewise from it. The only benefit I can see is not turning on the oven and using electricity/gas and warming up the house. I’ll have to try some Salt Lick on mine next time. Thanks for the idea. I hate all people who can get real Hatch chiles. I hope you get one stuffed up your nose! (ha ha) But seriously jealous here. Somebody drank their Hate-o-rade. I’d have sent you some had I known you couldn’t get them. I love hatch chiles! But since I live in Cleveland, I order a ristra and use them dried throughout the year. Surprisingly, there are not a lot of recipes for dried hatch chiles on the net. Any suggestions would be welcome! Thanks for stopping by, Sandy. 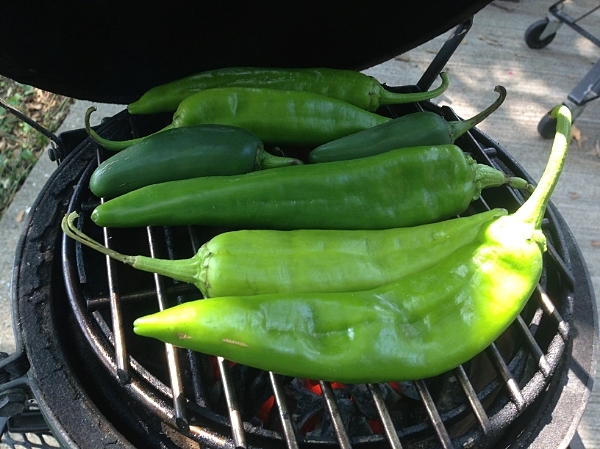 I don’t have a ton of Hatch chile recipes, but feel free to look through my site for a few more. Thanks for the recipe. I’ve made these a couple of times following the recipe. I’m making a batch right now but with two changes. Using Anaheims instead of Hatch, that’s all that store has so far. Using less lime juice and added pineapple juice to make up the difference. These look great! 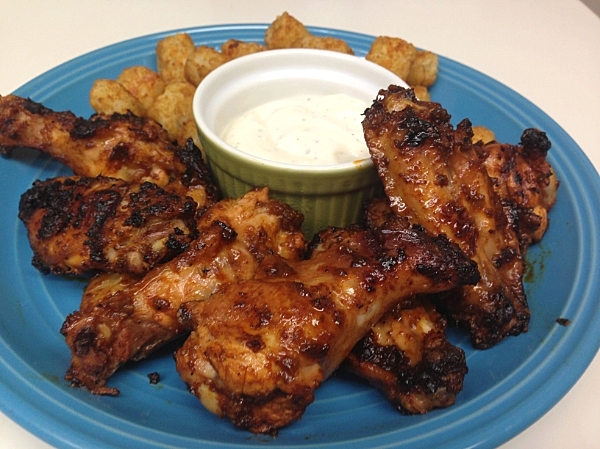 I absolutely love chicken wings. I’m Ashley I work for the Hatch Chile Store! I would like to know if you’d be interested in some free Hatch green chile to use in one of your recipes? You can email me at ashley@hatch-green-chile.com and we can discuss more details. Thanks!